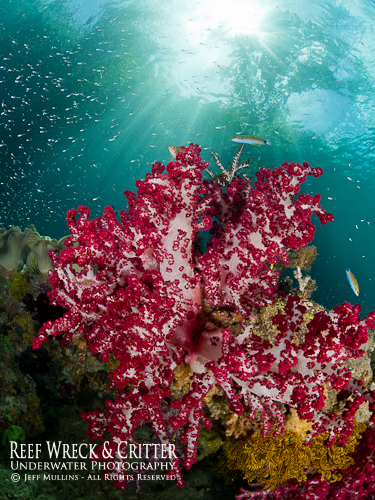 Arborek Bommie has beautiful soft coral and fish life in shallow water. 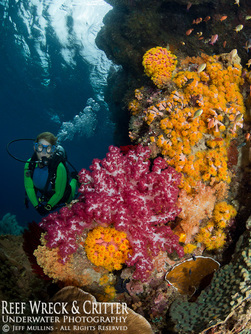 Gillian Robertson snorkels above the spectacular reefs of Fam Passage. Schooling snappers at Mioskon Island. 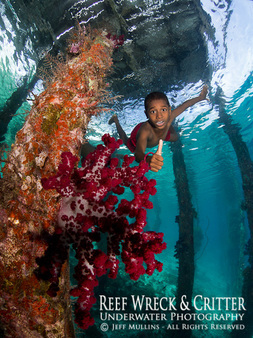 Raja Ampat is the location of the World's richest reefs. This group of islands surround the western tip of the island of Papua in eastern Indonesia. 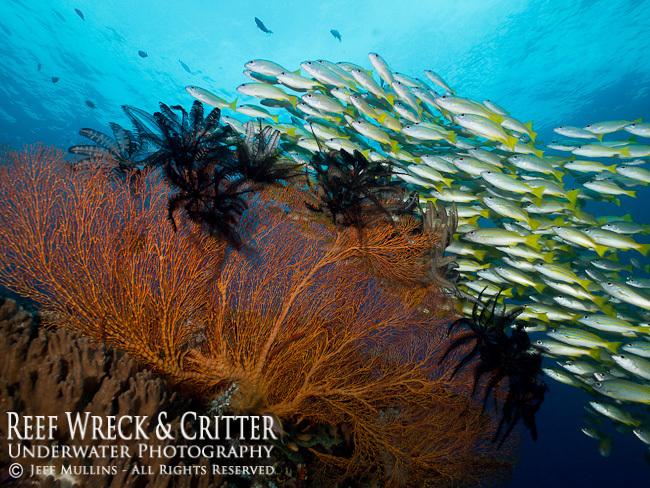 The reefs of Raja Ampat have the largest concentrations of fish and coral life anywhere in the World. 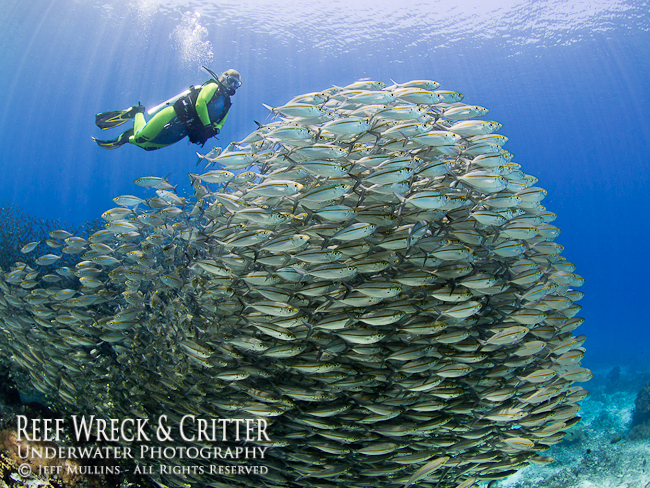 The area literally teams with masses of fish living around the the most colorful reefs on earth. Our next cruise with vacancies is in 2019. Please Contact Us﻿ for more details. 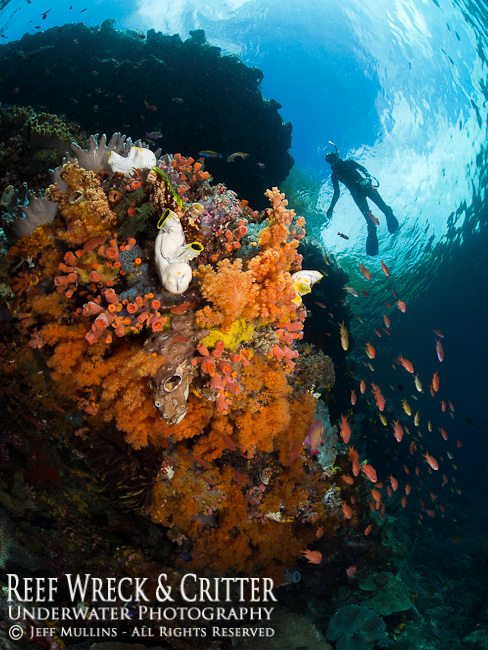 Dive on reefs accompanied by dense schools of fish and be surrounded by reefs of unequalled richness; literally dripping with soft corals, seafans and sponges of every colour imaginable. Descend on sand slopes where rare and exotic critters hide in cryptic homes, even a walking shark! Explore below jetty's where schools of fish surround the soft coral covered piles and schools of batfish meander. 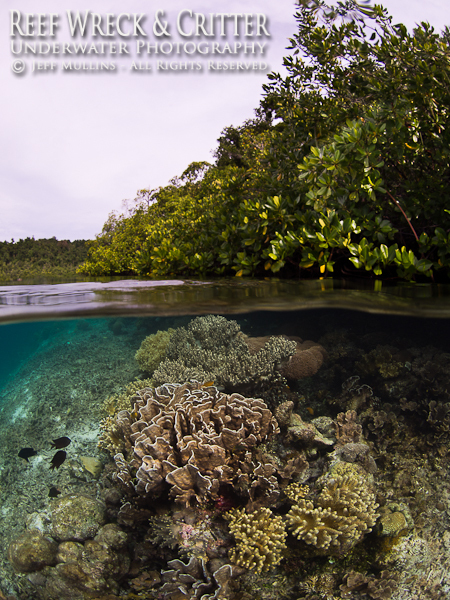 Dive on shallow coral reefs that grow right up to the surface among mangrove trees, the perfect location for half-in, half-out photos. Explore the steep walls and ledges of a sheltered island where rare nudibranchs and small critters abound. Drift through a narrow, river-like channel between two islands, where jungle reaches down to the surface of the sea. Below the surface brightly coloured soft corals and sea fans reach upwards to almost touch the overhanging trees that line the limestone cliffs. Nudibranchs in all shapes and sizes feed in the shadows. Cruising among islands of incredible beauty. 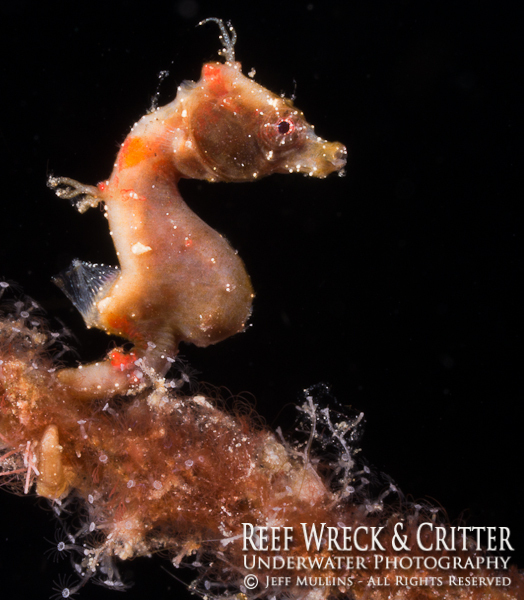 Fantastic diving with opportunities for both great macro and wide angle photography. No unnecessarily long boat journeys. No-one rushed to finish their dives, with ample bottom time on every dive. No-one watching you still have 50bar when you board the dive boat. Free help with your underwater photography. All levels of photography & camera types catered for: Compact, Mirrorless, DSLR & Video. Free help with editing your photos with Adobe Lightroom. These trips are all about fun, u/w photography, plain relaxing, diving and cruising around the picturesque islands of Raja Ampat. Raja Ampat is a remote area and requires two flight legs out of Bali. We organise accommodation for one overnight on the outward leg of the journey, which is included in the cost. We set our trip length at 12 days, as we then get to cruise at a sensible pace, with enough time to travel comfortably between dives and have limited overnight motoring. Our plan is to be anchored or moored each night at a night dive location, and most travelling will be between dives during the daytime. The rock islands inside Penemu Lagoon are spectacular when travelled by dinghy. 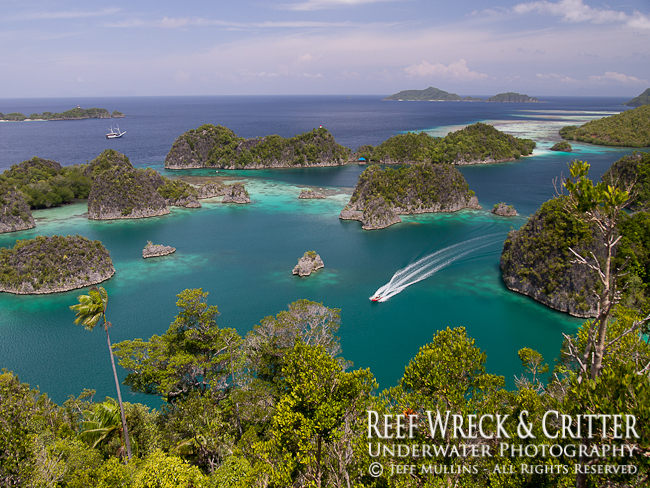 There is more information and photos of our live-aboard vessel at Raja Ampat - Vessel Details page. We also have a video about the MV Kalabia, a floating education centre traveling around the islands of Raja Ampat. This video was produced by our good friend professional videographer Chris Paporakis of Spice Island Films. If you have any questions not answered here then please use our Contact Us - Live Aboard page.